Eridian weapons are weapons that have been left behind on Pandora by the Eridian Alien (to humans at least) race. They have a curved, organic appearance, and they do not use standard ammunition like most other weapons found on Pandora. Furthermore, their weapons utilize technology that consists of harnessing the universe's energy; thus, their weaponry only consume charges from their "Magazines" when fired. These magazines or energy reservoirs will restore to max capacity if the weapon is not fired for several seconds; thus, obeying the Law of Conservation of Energy, stating that energy cannot be created or destroyed in an isolated system providing a weapon with theoretically infinite ammunition. Eridian weapons recharge while in a non-active weapons slot, making it possible to switch between several Eridian weapons without waiting for one to cool down. A discharged Eridian weapon can also be instantly recharged by unequipping and reequipping the weapon. There are Eridian equivalents to all conventional types of in-game weapon types except for the Pistol weapon type. However, all variants share the same "Weapon Proficiency." Note that despite the appearance of the projectiles fired, only a select few weapons deal shock damage. In addition, your character will move slightly slower with most of these weapons equipped. All pre-Knoxx Eridian weapons have a rarity color of green, but are much harder to come by than other green weapons. 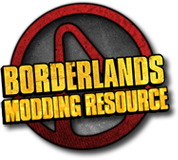 "The Secret Armory of General Knoxx" DLC introduced several new Eridian weapons. 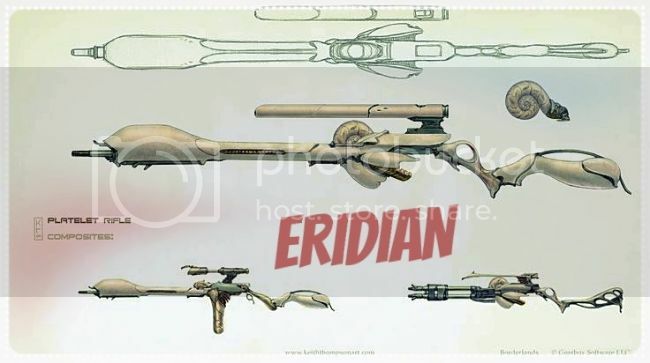 A few of these models, such as the Eridian Mega Cannon come only in Legendary varieties. However, just as their green counterparts, these guns have exceedingly rare drop rates, surpassing Pearlescent weapons. Excluding the higher-tier weapons such as the Eridian Mega Cannon they can be commonly found in Crimson Lance chests, and less commonly found in red chests. Because Eridian weapons have hefty restrictions on the part combinations for each weapon type, same-level Eridian weapons tend to be similar if not identical to each other. For example, any archetype is limited to only one barrel and most of them are limited in their scopes (scopes do not affect accuracy BTW). The different grips, accessories, and stocks have not been documented to affect stats, meaning only the body and magazine can have any real effect on the weapon's statistics. Weapons of the same archetype will always have the same function, description, and general organic appearance; although the special effect may differ slightly.